I-405, the main freeway through the Eastside, is in the midst of a massive widening project that could continue for decades and cost tens of billions of dollars. The website Road to Ruin has ranked it as the 4th most wasteful road project in America1, and it is considered by some to be the greatest man-made disaster that the Northwest has ever experienced. I-405, the commonly used name for Interstate 405, is a 30-mile freeway that loops around the eastern side of Lake Washington in the Seattle metropolitan area. It was intended to serve as a bypass for the heavily congested I-5 freeway through downtown Seattle and has become the major north-south route through the rapidly growing Eastside. I-405 has become increasingly congested in recent years and now experiences very slow traffic movement through much of the day. In fact, it is often at least as slow as I-5 and ranks as one of the most congested routes in the entire Northwest. This situation is commonly attributed to the continued growth of the Eastside, which now rivals Seattle in terms of population and economic activity. At the center of the Eastside and I-405 is Bellevue, which now has the second largest urban core in Washington State and which has become a major destination for people from throughout the region. There has been considerable support for this solution. In particular, it has been vigorously pushed by many businesses, who claim that it is necessary to ensure the region's continued mobility and competitiveness. This includes, but is not limited to, businesses for whom the project represents a major bonanza in paving and other construction contracts. It has also received much support from that large segment of the public that is unaware of its true costs (both monetary and other) and is not aware that there could be a much more effective and far less costly alternative. What is Wrong With This "Solution"
Despite this vast expenditure, there little prospect that it will accomplish its stated goals. But even worse, it will likely result in a major degradation of the environment and quality of life on the Eastside. First, with regard to relieving congestion, there is little evidence, either theoretical or empirical, that adding more lanes to a freeway reduces traffic congestion and speeds up travel other than just, perhaps, temporarily. Freeway widening projects in other major urban areas in the U.S. have produced mixed results, at best. The reason is that creating more road capacity just increases the number of vehicles using it. Also, total trip times can increase because of greater congestion on roads leading to the widened freeway as more people try to use it. The situation will be exacerbated if the Eastside's population continues to increase at its current rapid rate as projected. Moreover, the construction itself will likely produce some congestion during the years in which it is taking place, due to lane closures, repaving, restriping, etc. The claim that widening the freeway will increase safety likewise does not make much sense when seen from a broader point of view; in fact, it is likely that it will further reduce safety. The reason is that even if were there to be a decline in the accident rate per vehicle mile, there would likely be a greater absolute number of accidents (and thus more injury, death and property damage) because of the greater number of vehicle miles. A far more effective way to increase safety would be a reduction in the volume of traffic. The adverse environmental effects of adding lanes as well as expanding the entire road infrastructure (i.e., i.e., primary and secondary arterials, more parking lots for vehicles, more gas stations, etc.) to accommodate the wider freeway will, in fact, be far reaching, and it is doubtful that improvements to storm water runoff and salmon habitat will do much to offset them. 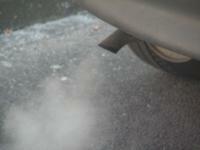 Vehicle emissions are a major cause of disease and premature death. One way in which the massive I-405 widening project will damage both the environment and human health is by increasing air pollution and the output of greenhouse gasses. Although air quality on the Eastside is still far superior to that in the most heavily affected urban areas, such as the Los Angeles basin, it has continued to deteriorate in recent years despite stricter controls on vehicle emissions. This is because of the rapid increase in the number of vehicles. It is also because the catalytic converters required on them may not substantially reduce discharges of some components of air pollution, particularly invisible ones6. Increased vehicular traffic also creates more air pollution consisting of microscopic particles from brake linings and tires. There are still more adverse effects of increased air pollution. For example, it has been shown to harm plant life, including reducing the vitality of forests and even killing mature trees. It has also been shown to damage property, including accelerating the deterioration of paint on buildings. In Europe, air pollution is believed to be accelerating the deterioration of statues and stone facades of historic buildings. Another harmful effect from the large increase in land area devoted to additional pavement for the widened freeway, expanded arterials and more parking to accommodate it is a reduction in the amount to land that is available for percolation of rainwater into the ground to recharge underground water supplies. In addition, the increased number of vehicles and greater pavement will also lead to more toxic runoff, which contributes to water pollution and can harm marine life. Moreover, the massive widening project does nothing to address growing concern over the region's ever-increasing dependence on imported fossil fuel and about global warming. Rather, it seems to be a major step towards aggravating these problems instead of helping to solve them. An additional effect of the widening of I-405 and the widening of arterials that will be necessary to feed it is the consumption of a very large amount of land. Much of this land currently contains trees and other plant life and serves as habitat for wildlife. It also represents parts of people's yards and businesses, and it could greatly reduce the values of such properties even if it does not consume them entirely. The widened freeways and arterials will also reduce the values of other nearby properties that will become closer to them and thus suffer from greater noise and air pollution. The widening of I-405 could also become extremely harmful to the Eastside in yet another way. It is being used as a convenient excuse to dismantle the lightly used but still completely functional railroad that runs roughly parallel to it. Because of its strategic location, this railroad is well suited to becoming the core of a light rail system that could accommodate far more people than the added lanes to I-405 and at far smaller cost, both monetary and in terms of damage to the environment and public health. Cities all over the U.S. (even including such automobile-dominated cities as Los Angeles) have been preserving their railroad lines and starting passenger transit services on them in recent years. This reversal of the former policy of abandonment and dismantling has been a result of the realization that light rail and other forms of rail transit can provide a superior alternative to more and wider freeways, including greater capacities, freedom from congestion, minimal environmental effects, greater safety and freedom from reliance on fossil fuels. Specifically, WSDOT is citing what it claims to be a $30 million cost for widening the Wilburton Tunnel, which the freeway uses to pass under the Eastside railroad just south of downtown Bellevue, as a justification converting the tunnel into an open cut and thus severing the railroad at this point. This cost, even if correct, is only only about the same as WSDOT's projected cost for two and a half miles of freeway lane and virtually insignificant in the context of a $20 billion project. It is clear that something is terribly wrong with the I-405 widening project. Not only is extremely costly in terms of the region's limited financial resources, but there is serious doubt that it will do much, if anything, to alleviate traffic congestion and improve the region's mobility. Moreover, it will likely have serious consequences for the Eastside's environment and public health, and contribute to the destruction of what has made the Eastside such an attractive place to call home. The cause of this massive boondoggle is apparently similar to what has caused such disastrous public policy in other regions in the past. It is undoubtedly in large part due to the failure to look at the entire transportation issue together with environmental and public health issues when making the plans and instead just think about what can be done to accommodate more cars. Just planning for more cars is a lot easier and requires a lot less imagination than looking at the entire picture. The good news is that the project is still in its early stages and has received only a small portion of the funding that will eventually be required. In addition, there may be a growing awareness on the part of the public of the true nature of the project and its implications for the quality of life in the region. Hopefully, the proposal to dismantle the railroad and the publicity that it is generating will become a stimulus to increase public awareness that all is not well on the Eastside. 2WSDOT says on its website: "The End Result: Every Trip Faster and Safer When fully implemented, the I-405 Master Plan will save over 13 million travel-time hours every year - a value of $569 million annually. 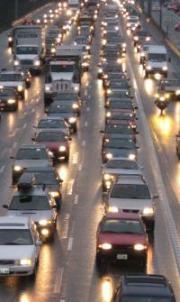 Fewer traffic accidents will save an additional $42 million each year. The plan creates about 1,700 new vanpools, increases transit service by 50 percent, and builds 5,000 new park-and-ride spaces." I-405 Corridor Program, WSDOT, 2006. 3WSDOT estimates that it will cost $12.4 to $14.0 billion in 2004 dollars and take 20 years or more. See Highway Construction Costs: Are WSDOT's highway construction costs in line with national experience?, WSDOT, November 3, 2005. Taking inflation into account, this figure could easily increase by 50 percent or even double. Moreover, it is common for projects of this magnitude and duration to substantially underestimate the ultimate costs, perhaps by oversight, perhaps as a necessary means to obtain approval for the project. In addition, these figures only consider direct monetary costs, and not the costs of environmental damage, effects on public health and other externalities. 4The Big Dig was designed to replace an elevated freeway through Boston with an underground one in large part in order to restore the urban environment. Although the goal of removing the much disliked eyesore was an admirable one, it turned into one of the most costly and controversial engineering projects in human history. At $14.6 billion, it cost more than twice as much as the Panama Canal in today's dollars, according to the article $14.6 billion later, Boston's Big Dig wraps up, Christian Science Monitor, December 19, 2003. It is ironic that the I-405 widening project is creating the type of monstrosity that the Big Dig was designed to eliminate. 6Although they are generally reliable and have been successful in reducing noxious tailpipe emissions, catalytic converters are not entirely benign. This is because they result in increased consumption of fossil fuels. They also cause increased output of carbon dioxide and nitrogen oxides, both of which are so-called greenhouse gasses that are believed to be major contributors to global warming. In addition, there could be adverse environmental effects from the production and disposal of the catalytic converters. 7A recent University of Southern California study provided even stronger evidence than previous studies that children living near busy highways have significant impairments in the development of their lungs that can lead to respiratory problems for the rest of their lives. This study differed from earlier ones in that it involved a substantially larger number of children and followed them for more years. For a summary, see Living Near A Highway Affects Lung Development In Children, Study Shows, ScienceDaily, January 26, 2007. This page created January 27, 2007.